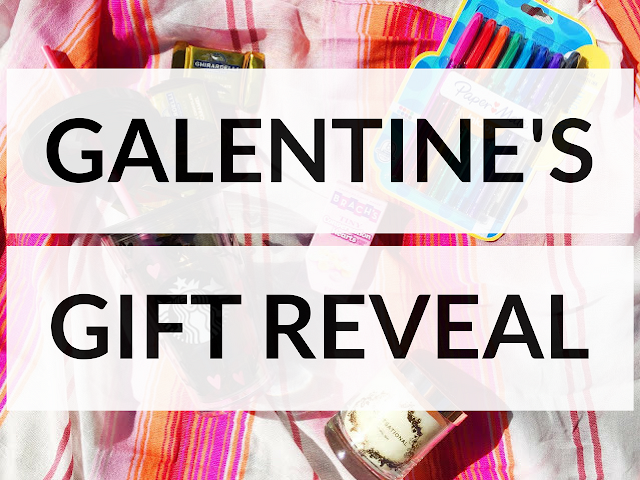 I'm excited to share the for Galentine's today, I linked up with Mattie and Olya to participate in the Galentine's Day Blogger Gift Exchange, which was a pretty neat Secret Santa style exchange. I was lucky enough to gift to Janell, and ironically, my gifter was her roommate, Sammy. Sammy blew it out of the park with an awesome package! She satisfied my sweet tooth and Starbucks love with a gorgeous iced coffee tumbler (hearts are my favorite!) filled with Ghirardelli caramel chocolates (which I ate way faster than I would like to admit). The colored pens - oh, I am in love. As a full-time professional and full-time grad student, these pens are perfect for organizing and color coding. Maybe I'll use them to start a bullet journal (someone help me find the perfect one, please!). Conversation hearts are a Valentine's, or should I say Galentine's, must-have. Andre and I are obsessed with candles and a smell-good home, so this candle is definitely getting used! ;) And lastly, how pretty is the lightweight scarf she sent? Not only is it perfect for this warm Georgia weather, but stripes and pink? It's like she knows me! What do you think of the gifts Sammy sent my way? 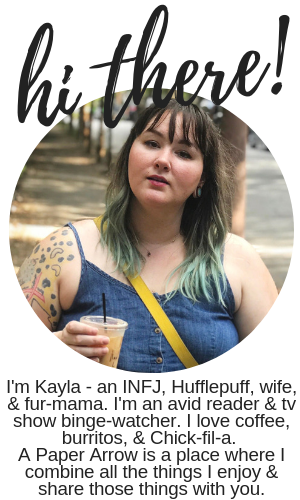 Do you think she killed it or what? Ohh, you got some great stuff! The tumbler is super cute and I can 100% guarantee I'd eat those chocolates embarrassingly fast too! YES! My gifter was awesome! Those gifts are awesome!! 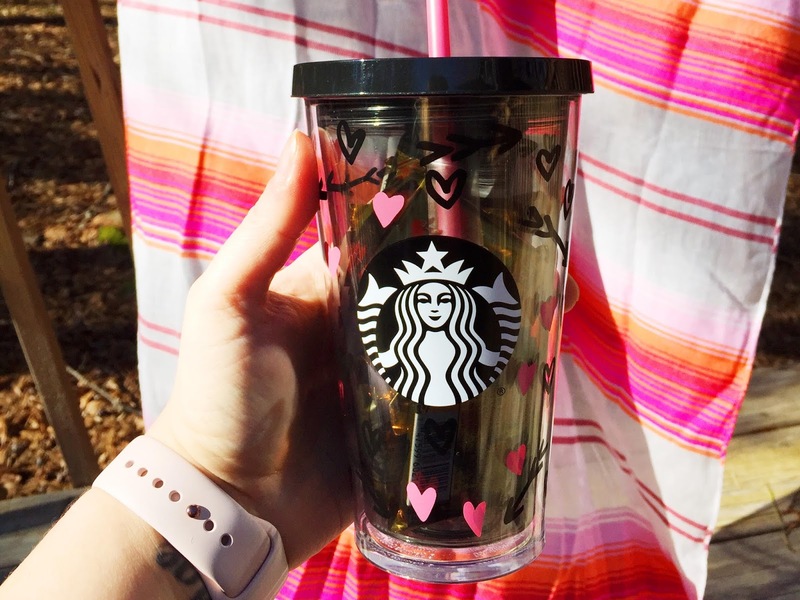 That tumbler is super cute! That scarf is cute too, I have an obsession for scarves! Love how cheerful and springy it is! It would've worked well here in Kentucky last week, too :). Yes. She definitely sent some wonderful things! I love everything about what she gave you! 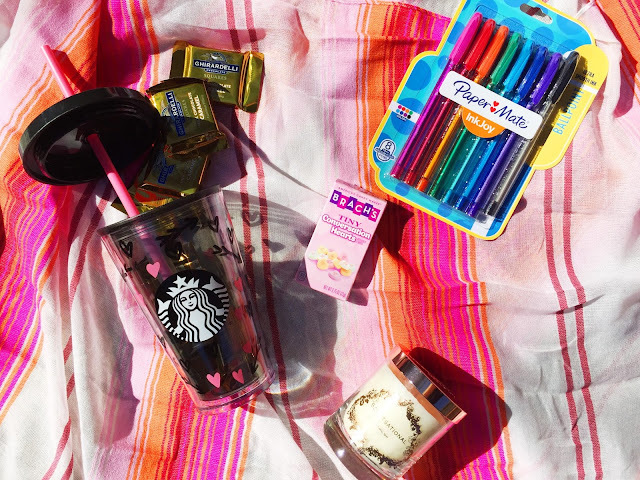 That tumbler is adorable and colorful pens are pretty much my love language! Haha. I'm glad you enjoyed your gift! Yes! It's so pretty. She did such a good job!